Andrew Watson guides us through the pitfalls, triumphs and technological developments of lighting in mines over the years. The first place that required lighting to enable work to be carried out safely and productively would probably have been coal mines. In the early days of producing coal from outcrops this would not have been a problem, as natural light would have been perfectly acceptable and safe. As mining progressed, bell pits were developed by digging down into the coal seam and widening out the take of coal into the shape of a hand bell. This necessitated the use of artificial lighting, initially in the form of naked flames from candles, followed later by oil and carbide lamps to illuminate works. As mining continued to progress and bell pits were ‘joined’ underground by connecting roadways, coal was mined further and further from the connections to the surface. While this was fantastic for industry, this created two safety problems. 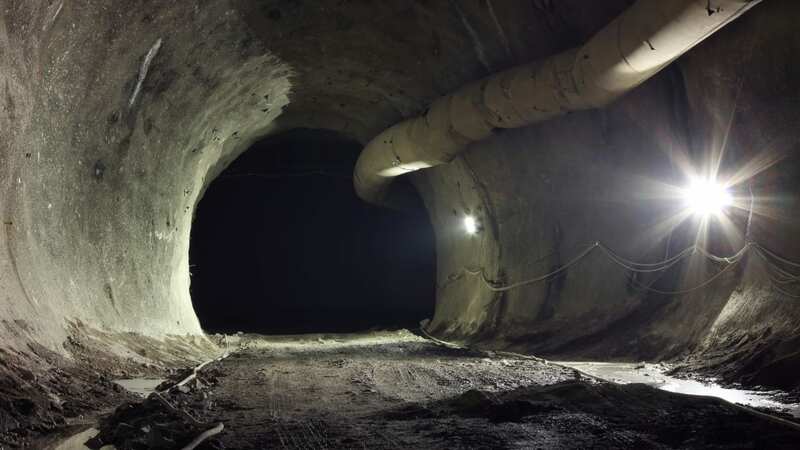 The first and most obvious problem was the need to illuminate the underground work. The second was to provide sufficient fresh air to ventilate the working area. The solution to the first problem was to increase the use of naked lights. This allowed the work to continue to develop further from the connections to the surface. Mineworkers were being killed or injured, however, due to the lack of adequate ventilation in the workings to both provide breathable air and dilute mine gases. The early solution to this was to light fires at the base of the shaft connected to the surface and allow the hot air to rise within the shaft. Fresh air would then be drawn down other shafts or from surface connections to create an air flow. This was quite successful up to a point. As the need for coal increased, so too did the area of the mine workings. This increased the problem of explosive mine gases collecting, mainly methane, as well as creating oxygen deficient atmospheres in other areas where ventilation was inadequate. Released from the coal being mined, methane was known to miners as firedamp, because naked lights ignited it. Sometimes it burned; at other times it might explode. This was dependent on the percentage available at the ignition source, which was normally the naked flame light. If it was less than five per cent, the methane might only burn. If between five and 15 per cent, the presence of a naked flame could result in an explosion. Beyond 15 per cent there was insufficient oxygen in the atmosphere to support combustion. Oxygen deficiency was known to miners as blackdamp. As the oxygen content in the mine environment reduced due to poor or non existent ventilation, miners noted that the amount of light emitted from their candles or oil light reduced and eventually the flame extinguished, leaving miners in darkness in an oxygen deficient atmosphere. Clearly this was not acceptable from a safety perspective, but it also limited the production of a much sought after and valuable resource. "when sampling for oxygen deficiency it was noted that as the oxygen content of the mine environment reduced so too did the illumination provided by the flame"
The early solution was to employ a ‘fireman’ to enter the mine workings first to test the mine environment. The fireman would cover himself in wet sackcloth, and hold a naked flame on the end of a long stick. His job was to find the methane and ignite it to allow it to burn prior to the miners entering the workings to produce coal. If he was lucky, the methane would burn in front of him and he would be safe. If he was unlucky, however, the methane would explode and ‘flash’ over him. If he was very unlucky, he could potentially ignite a large amount of methane and suffer the consequences. Another replacement fireman would then have to repeat this exercise. This was clearly not acceptable as a long-term solution. There was an urgent need, therefore, to provide miners with a safe means of illuminating the workings that would not ignite any methane that was present in the mine. Prior to the nineteenth century, several inventors turned their minds to the problem. The three most well known inventors involved in this enterprise were Dr William Reid Clanny, Sir Humphry Davy and George Stephenson. The first of these eminent minds to come forward with a solution was Dr Clanny. Clanny’s solution was to enclose the flame in glass and surround it with water to fully enclose it. A set of bellows supplied the flame with oxygen through a tube. This design, however, was complex and impractical for daily use by mine workers. The next suggestion was put forward by George Stephenson. His idea was to encase the flame with a glass cylinder, which was then capped by a metal cover. The metal cover featured small holes and was further protected by a metal bonnet to remove the flame from the methane. This worked, and was much more practical for daily use by mine workers. Sir Humphry Davy’s solution was to surround the flame with a metallic mesh screen. This allowed air to pass through the mesh to ensure the flame continued to burn. What Davy had discovered during his experiments was that if the holes in the mesh were small enough, the mesh would cool the flame, reducing the amount of heat available to such an extent that it would not ignite the methane. Davy’s invention was further improved by enclosing the flame in glass, placing a fuel reservoir below the flame, putting two mesh gauzes over the flame and covering them with a bonnet to protect them. We then had the first truly safe and practical light for use in a dangerous underground environment. A further advantage of the Davy lamp was that it could be safely utilised to sample the mine environment for both the presence of methane and of an oxygen deficient atmosphere. When sampling the mine environment for methane it was noted that the flame burned blue on top of the lamp flame. This detection became incredibly refined; for example, with the lamp burning a small, yellow tipped test flame, it was possible to determine the percentage of methane present in the mine environment. It then became possible to set ‘safe limits of methane’ for miners to work safely. When sampling for oxygen deficiency it was noted that as the oxygen content of the mine environment reduced so too did the illumination provided by the flame, to the point that eventually the flame would extinguish completely. This provided a warning system for the miner. The advantage of being able to sample the mine environment and to safely illuminate work had obvious safety and production advantages. In fact, flame safety lamps are still in use in coal mines today. So was the problem solved? Of course not. This was for two main reasons. While the flame safety lamp could be used safely, it did not provide sufficient illumination for miners to work safely and produce the amount of coal required. Secondly, if the lamps were not maintained and used correctly they could become a possible ignition source for the mine gas - the slightest damage to the gauze would allow the flame to ignite gas. It was accepted that a lamp was required that provided much better illumination qualities that did not depend on a naked flame. In 1914 a company founded by mining engineers John Ryan and George Deike developed one of the first electric lamps. They employed an inventor of the day, Thomas Edison, to assist them in developing a reliable and safe electric cap lamp that could be easily carried while still allowing the miner to work easily. Edison’s design consisted of a battery encased in a steel case that could be locked. The battery was worn on the miner’s belt and was connected via a cable to the lamp, which was fitted to his cap. The cable was encased in a steel cover to protect it from damage. The battery could provide illumination equivalent to that of six candles. It was capable of providing enough power to last 12-hours and could be recharged between shifts. If the lamp was broken or damaged, the electrical connection immediately disconnected and the tungsten filament in the bulb cooled to ensure that it would not be capable of igniting any flammable gas that was present in the environment. We now had the first intrinsically safe lamp for use in a potentially explosive environment. Until recently not much had changed with safe lamps for use in potentially dangerous environments. Recent improvement has been in the development of the battery. There is no longer a need to have a battery worn on the belt, as it can now be built into the lamp. It still provides sufficient power to last well over a normal working shift, while producing ever-increasing amounts of equivalent candle power. Problem solved? Yes and no. Lamps can be, and still are, a source of ignition when being used in a potentially explosive atmosphere. There are many records of accidents and incidents where lamps have been found to be the ignition source, causing severe burns and fatalities. Lamps for use in potentially explosive atmospheres must be maintained as required by the manufacturer and used carefully to ensure that the risk of them being damaged while in use, in a potentially explosive atmosphere, is eliminated. An example of this misuse, provided by the Health and Safety Executive, is when a lamp is used by those involved in motor vehicle inspections. The inspector is underneath the vehicle in question, normally in an inspection pit. Petrol vapour, which is heavier than air, has been allowed to collect in the low lying area of the pit. An unsuitable, poorly maintained or damaged lamp is then introduced into the pit, providing a source of ignition for the petrol vapour. This could result in a fire or explosion, severely injuring the person carrying out the inspection. It should also be noted that the use of low voltage lamps in the example given above would give no protection whatsoever in a potentially explosive atmosphere. Protection must be provided by the design and construction of the lamp. Great care must be taken when selecting lamps for use in potentially explosive atmospheres. For further information refer to BS EN 60079-14 Electrical apparatus for explosive gas atmospheres - electrical installation in hazardous areas. When in discussion with suppliers of lamps for use in a potentially explosive atmosphere, the supplier must be made aware of the nature of the explosive atmosphere in which the lamp might be utilised. If a lamp is purchased to provide an acceptable level of protection in a certain set of circumstances, then it must not be used in a different set of circumstances without first undertaking research and carrying out a risk assessment to ensure that the lamp is suitable for use in the new circumstances. Always carry out the manufacturer’s maintenance requirements on lamps for use in potentially explosive atmospheres. Records of maintenance should be checked prior to the lamp being introduced into said atmosphere. The lamp should be carefully checked and tested by a suitably competent person for any sign of damage prior to use. The lamp should be checked again prior to storage to ensure that no damage occurred while the lamp was in use – this is to prevent the temptation to use a damaged lamp when it is next needed in an urgent situation. The lamp should be carefully stored to ensure it is protected from damage. "today there are many lamps available that are suitable for use in potentially explosive atmospheres"
Under no circumstances should any repairs be carried out on a lamp while it is in a potentially explosive atmosphere. This includes changing batteries or bulbs. The lamp must be removed from the atmosphere and any repair carried out by a competent person. The lamp should be checked and tested following any repair work. There is a recent example of a worker cleaning an aviation fuel tank with chemicals. The confined space of the tank was too warm for the worker to carry out his work comfortably. He decided to unplug his lamp to allow the tank to cool. The lamp was plugged in to an extension cable, which was also in the tank. The resulting spark caused by the unplugging of the lamp ignited the fumes from the cleaning chemical, causing an explosion. The worker was severely burned, and unfortunately, will never work again. This is an example of poor hazard identification, poor understanding, poor risk assessment and insufficient and ineffective controls being implemented to reduce the risk to an acceptable level. The previous example was worsened when it was realised that there was no need to use the cleaning chemicals at all. Soapy water was perfectly adequate to clean the tank, which would have eliminated the specified risk in the tank and removed the need for a safe lamp to have been required in the tank in the first place. Today there are many lamps available that are suitable for use in potentially explosive atmospheres. They are all designed and constructed specifically for use in these high-risk environments. Ensure you have a full understanding of the hazards, carry out a suitable risk assessment and purchase a lamp that will reduce the risk to an acceptable level. Once you have purchased the correct lamp for your circumstances, ensure it is used, maintained and tested as required. Ensure those required to use the lamp are competent in its use it and understand the implications of any misuse. They should understand the hazards of the potentially explosive atmosphere and should, preferably, have been involved in the creation of the risk assessment. As a minimum, they must fully understand the risk assessment and the implications of not following the control measures as required.